i like the wallpaper the background looks good. i like the colors, and the ideea for the scene is nice. i like the change of colors in the sky it's a very good idea , and the effect (the little light ) wich came from the water (with a very good effect, it 's hard to do it ^^) give a very nice impression. Beautiful wall ! what a beautiful wallpaper it looks so pretty and dreamy =^-^= I'm adding it to my faves for sure! Really beautiful wallpaper. The whole idea and the first look is really cool. But the stars coud shine a bit more. And why are there these star-like points on the plants at the bottom? MOON is fit with this lovely girl. The wallpaper shows a aesthetic feeling to me ! Thank you ! Great one , clichy but i like it.But you should use a tree brush i think.And this THING on the water looks kinda blurry like resized ... nevermind still nice one. It isn't hideous, thats for sure! I love the water effects. I guess you refreshed your memory enough. I like this scan alot. Great idea for a wallie! ""dedication to my friends who've stuck with me through the hardest times! ^^ arigatou! and thank you to all of you who still view my works! i really appreciate it ^^""
^_^ aw, moon-chan-sama made a new wallie! ^_^ oh it's so preety, i really see no flaws in the wallie, i love the water, it's so preety O_O neh great job! Once again beautiful wallie! 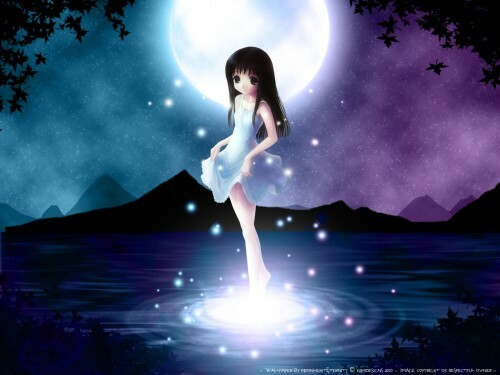 So pretty and the the moon compliments her so well!